We were supposed to spend the day on the island of Rhodes. The Garden Isle. With a relaxing full day tour of Rhodes and Lindos. Instead the seas were rocking and rolling. We went to breakfast. We heard the "voice of doom" over the loudspeaker indicating they were checking with the port authorities and looking at the options. Within a half hour the voice returned. There were no options. Instead we were going to cruise straight to Crete and arrive at night instead of the next morning. The seas were unforgiving. Our cabin spent the morning sleeping. During that time the crew placed travel sickness bags of every possible surface in the public areas. We got up for some lunch and a little air. Bonus entertainment from the Cristal Entertainment Team (not quite the quality as on other cruise lines - but we smiled every time we saw them perform). Finally we got the announcement. She was no longer the voice of doom....she was the voice of opportunity. We were docking in Heraklion, Crete. Even better we could get off the ship. The crew at the gangway laughed at our enthusiasm to get off...asking us to at least move a few feet from the entrance before kissing the ground so the people behind us could get off the ship as well. There's a well marked pedestrian path from the port into the plaza via the waterfront. The main plaza is full of cafes, shops and of course, ice cream. But before we ever got to the ice cream we were sucked into Dr. Nemo Fish Spa. I've never seen a fish spa before. Maybe on the Amazing Race or on some other travel show, but not in person. When we stopped to talk to the staff, there was no one inside. It was 10 euros for 10-15 minutes, but she said we could have more time for free. A benefit for us. And for the shop. It's free advertising. 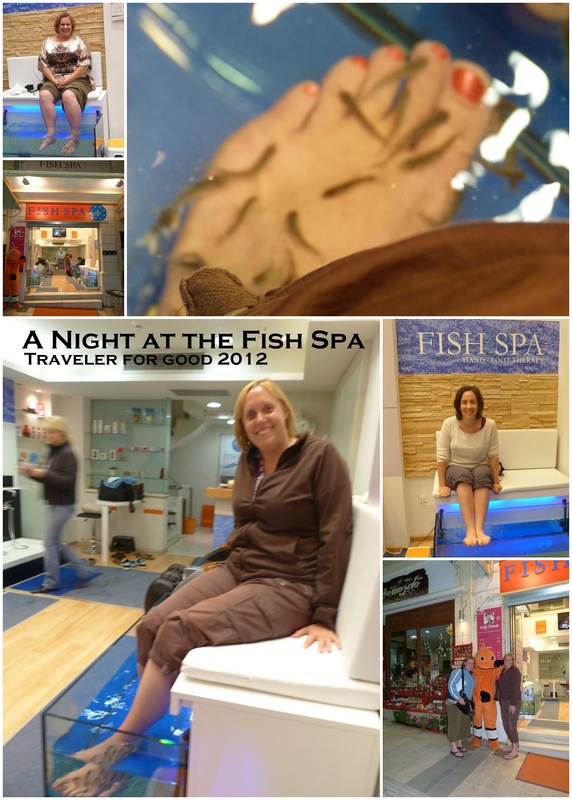 The minute that other people see you getting your feet "pedicured" by the garra rufa fish, they stop to watch, laugh, ask questions and take pictures. My feet are easily in someone else's vacation photos now. What does it feel like? It tickles...in a good way. It's fun - just for the novelty it's worth doing. And my feet were softer and smoother afterwards. Going to the fish spa was not on my list of "must dos" but it's certainly on my list of "glad I dids."